Selfie-Protz. HTC baut die Produktpalette um sein Flaggschiff HTC One M8 weiter aus und bietet mit dem Desire EYE ein Smartphone mit starker Hardware, welches sich aufgrund der hochauflösenden Frontkamera vor allem an Selfie-Fans richtet. Mit 13 MP und einem Dual-LED-Blitz verspricht die Optik gute Aufnahmen und kann im Test durchaus überzeugen. Eine IP-Zertifizierung rundet das Gesamtpaket ab. Ein in allen Belangen starkes Smartphone, vor allem die 13 MP-Frontkamera hebt das Desire Eye des taiwanischen Herstellers HTC von der Konkurrenz ab - Selfies gelingen damit auf jeden Fall. Dazu spendiert der Hersteller rundum leistungsfähige Komponenten, einzig der Akku fällt minimal nach unten ab. Insgesamt aber ein durchdachtes Gerät, die Qualität hat aber auch ihren Preis. Die Idee ist naheliegend: Großes Display, trendige Gehäuse-Farbkombinationen und eine 13-Megapixel-Frontkamera mit vielen Möglichkeiten für Luxus-Selfies – fertig ist ein Smartphone mit einem Alleinstellungsmerkmal für eine große Zielgruppe. Mit dem Desire EYE liefert HTC eines seiner hübschesten Smartphones ab. Das zweifarbige Unibody-Design sieht klasse aus, allerdings besteht so keine Möglichkeit mehr, den Akku auszutauschen. Die Hardware entspricht in etwa der des HTC One M8 und ist damit auf einem sehr aktuellen Stand. Die HTC Sense 6 UI lässt sich ohne spürbare Ruckler bedienen. Das Desire Eye hat mehr zu bieten als nur eine außergewöhnliche Frontkamera. Das Design gefällt, der Bildschirm und die Leistungswerte passen. Mit einem Preis von 499 Euro (UVP) platziert sich das Desire Eye allerdings weit nördlich der Mittelklasse - und hier weht ein rauer Wind. Großes Display, trendige Gehäuse-Farbkombinationen und eine 13-Megapixel-Frontkamera ... fertig ist ein Smartphone mit einem Alleinstellungsmerkmal für eine große Zielgruppe. Der Straßenpreis von über 500 Euro ist allerdings für die anvisierte Zielgruppe recht happig ... Technisch kann man dem Taiwaner allerdings nichts ankreiden und bei Ausstattung gibt es auch keine Mängel. Der Tester ist allerdings von der fehlenden Möglichkeit, einen Direktkontakt als Widget festzulegen, schlichtweg genervt. HTC reagiert mit dem Desire Eye auf den aktuellen Selfie-Hype. Das HTC Desire Eye zeigt sich im Test von seiner Schokoladenseite. Gute Display- und Akku-Werte plus zwei 13-Megapixel-Kameras machen das Desire Eye zu einem erstklassigen Allrounder. Das Smartphone ist allerdings kein Schnäppchen. Pro: robuster und wasserdichter Kunststoff-Unibody mit Topverarbeitung; beste Smartphone-Frontkamera auf dem Markt; Display und Prozessor stark; Stereo-Lautsprecher auf der Frontseite; bewährte HTC-Oberfläche Sense. Contra: hoher Preis; Akku nicht wechselbar. In einem ersten kurzen Hands-on-Test zeigte sich die Kamera ziemlich souverän: Die Bilder sind scharf und auch farbneutral. Das ist top. Die Ergebnisse, die der LED-Blitz zaubert, sind aber eher Geschmackssache. Bisweilen sind Bildteile deutlich überbelichtet, was den Personen eine ungesunde Blässe ins Gesicht zaubert. Gut: Die Kamera lässt sich auch mit einem Code-Wort auslösen. The Desire Eye does have its flaws, chiefly the previous generation Android version, average battery and hazy camera focus, but there is a lot to like about it. The Desire Eye features a robust design and decent screen, and above average performance when you consider its £400 price tag. Considering the lack of decent options available at the same price in the Android ecosystem at the moment, the Desire Eye is a solid option for any buyer looking for a decent mid-tier handset. Priced at Rs. 35,990, the HTC Desire Eye finds itself competing with its own brethren, the HTC One (E8) (Review) and the HTC One (M8 Eye) (Review | Pictures). Design-wise, the Desire Eye dares to do something different and succeeds. In fact, we'd go as far as to say that quite a few people will find this phone better looking than the other two, which are both modelled around the HTC One (M8). Highly competent. That is simply what the Desire Eye is. Photographically well endowed at both front and back, waterproof, reasonably affordable, well made, robust and blessed with a very nice display. It’s a hard device not to like unless you absolutely must have a removable battery. 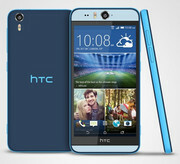 The Desire Eye is again a superb looking smartphone from HTC which is as powerful as their flagship device, the One (M8). It is also a selfie centric handset offering a front 13MP camera with a dual-tone LED flash and even a rear 13MP camera which both can take great pictures. It is defintely highly priced, making it sit with HTC's other flagship devices, which is slightly confusing, but gives the consumer an option for a slightly larger device. Were it not for the current crop of absolutely beltingly brilliant phones that are now available for similar or less (we’re looking at you, Moto X and LG G3) the Desire Eye would be getting the full five stars. As it is, we’re looking at a very capable, very likeable four starrer that should be promoted to first choice by those who really love a selfie. Thanks to the beautiful selfies the HTC Desire Eye churns out, you're bound to become the most popular photographer in your social circle. In addition to its strong camera quality, the Desire Eye packs a vibrant display, booming speakers and capable performance in a sleek, fun body. Although I wish the phone offered more juice for longer-lasting photo sessions, those who live through their portraits will love the Desire Eye. I spent a number of weeks with the HTC Desire Eye and had a very enjoyable time using the large screen for watching videos and browsing the internet. I also loved the design with materials used and the red/white combination also looks really cool. Then came the part which let me down… at least in what I was expecting. The standout feature -the camera. As such, the phone sits in an awkward limbo between mid-range and high-end handsets. If you’ve already budgeted $150 for a phone, another $50 opens you up to a much bigger range of options. The $50 to $100 landscape is much more barren, and the Desire Eye could be a champion in that territory. Banking on an eventual price drop might not be a bad idea. The Desire EYE has quite a bit going for it. If you are a selfie machine, then the 13MP front-facing camera should treat you very well. Your Snapchat followers will love you. In addition, for the $150 on-contract price, you are getting a great spec list, as well as a very well made device. If you carry this phone around with you, there is no doubt you will get a few compliments from strangers, as I know I got a few at my local drinking hole. It’s hard to beat the Eye’s dual high-res cameras. Throw in some cool design elements like those now-hidden BoomSound speakers and some attractive color options, and the Desire Eye finds itself becoming HTC’s most giftable handset this holiday season. Even though the EYE doesn’t come with a premium metal body, it’s still quite a rigid device. By the looks of it, the Desire EYE is designed for the selfie crowd that doesn’t want to compromise on performance, and likes to have fun snapping 13MP stills even when at the beach or water parks. It’s thin, big, lightweight, fast, quite a photographer and doesn’t mind taking a dive. Rather than pushing the camera features, HTC should have focused on the fact they've crafted a handset with great build quality and specifications approaching most flagship phones. The front-facing camera doesn't cope as well in low light as the HTC One M8 or the iPhone 6. But then the polycarbonate casing looks good, the phone won't break if you drop it in a sink full of water and it's not as expensive as the flagships. HTC Desire Eye is the most capable smartphone the Taiwanese manufacturer has to offer. Only its Desire moniker, the plastic body, and the smaller marketing budget prevent the newcomer from taking the HTC One (M8) spot as the company's Android flagship smartphone in the second half of 2014. We believe that many will find the capable duo of 13MP cameras and the IPX7 rating that HTC Desire Eye has to offer are well worth it over the metal body of the M8. The argument is especially valid for those who are into selfies. The Desire Eye is a really good phone, and could put HTC on the "upper-tier-but-still-mid-range" map. I hope it does, too. Of all the mid-range devices around, the Desire Eye is the one that will find a dedicated audience. Unless you’re going to buy an HTC One (M8) or LG G3, the Desire Eye is worth a hard look. 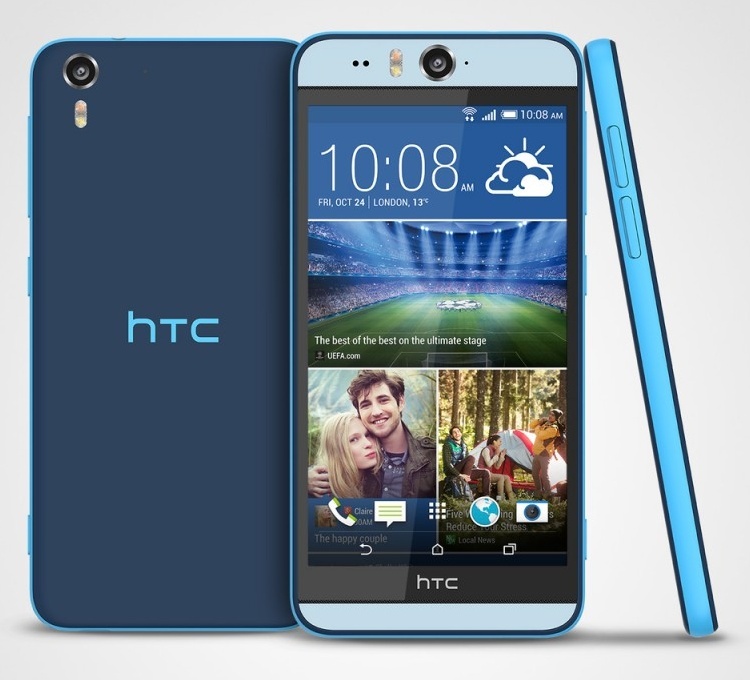 There you have it, all the good and the bad about the Desire EYE, HTC's selfie-centric handset. The device will most probably be priced as much as an HTC One (M8), which will pit it against many other devices that sit higher in the food chain. In spite of this, the HTC Desire EYE is arguably the best selfie-centric device out there – it has the upper hand when compared with other selfie-centric phones (the Sony Xperia C3, the Samsung Galaxy Grand Prime, and the Nokia Lumia 730). The phone will have a tough time competing with other upper mid-range and lower high-end handsets. Although it's not as premium as HTC's current flagship, the Desire EYE might be regarded as a viable alternative to the One (M8), especially with those users who highly value their selfie game. It takes the best selfies ever, but it's a big mistake to write off the HTC Desire Eye as simply The Selfie Smartphone. It's a strong choice for anyone looking for a solid midrange Android phone. It offers smooth performance and boisterous speakers and a full HD screen in a slick design. While it's not as powerful or as long-lasting as the HTC One M8 or the Samsung Galaxy S5, it holds its own against them as a slightly cheaper alternative. The HTC Desire Eye is a great phone despite the twin 13MP cameras rather than because of them. We daresay that this handset, with these internal specs, in this body, at a price of around £350, but with a front-facing UltraPixel sensor would be just as appealing. Perhaps the biggest downside is the relatively low capacity battery, which compared to something like the Xperia Z3, doesn't offer the greatest endurance around and is about the only nod to mid-tier compromise that the Desire name brings. If you're anything like me, the mere mention of "selfie phone" will be enough to make you run for the hills. But HTC's new Desire Eye is the rare novelty phone that backs up its niche focus with a damn good overall experience. Read on, for Gizmag's quick review. 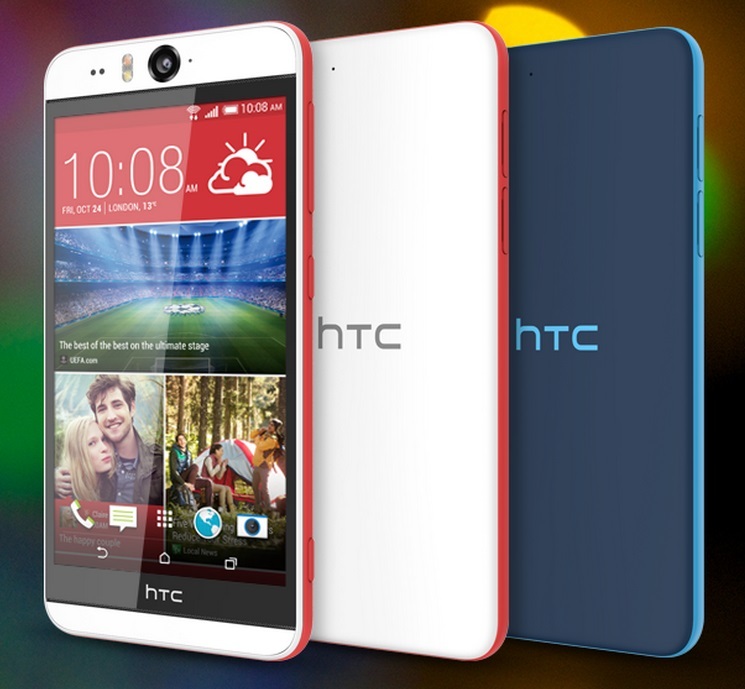 The HTC Desire EYE is a selfie-lover’s dream, but it’s the rest of the phone that surprised us. The performance is at flagship level, it’s water resistant and the design is, in the large part, solid. There isn’t another phone that directly compares. The OnePlus One costs a fair bit less and comes with a reasonable 5-megapixel front-facing camera. That phone is hard to get, though, as supply is limited. Another alternative is the slightly cheaper Nokia Lumia 830, but the front camera isn't as good and it's not as much fun to use because of middling performance. The HTC Desire EYE is a unique proposition. The HTC design team have created a device that kind of, sort of, ALMOST beats out the company's most heroic device of the year. The specifications on the EYE trump the HTC One M8 in several places. The look is different and - for those that don't love metal - a pleasing alternative take. I really, really like the HTC Desire Eye, and I’m not even a fan of selfies, unless I’m a bit tipsy. Take or leave that 13-megapixel front facer, because the rest of the phone is a joy. Between the solid performance, uber-long battery life, spacious HD screen and likeable waterproof design, the Desire Eye is a bloody great all-round portable pal. Other manufacturers have tried to chip in the selfie craze but most attempts we've seen have been halfhearted, some don't even go up to 5MP and almost none have a front-facing flash (electing to use the screen as a source of light instead). Last year Oppo introduced the N1 with a rotating 13MP camera with a dual-LED flash that services both regular and selfie photos but the phone never quite took off in Europe and the US. Das HTC Desire EYE ist ein Handy das speziell für die eifrigsten Selfie-Aufnehmer gemacht wurde. Es verfügt nicht über ein, sondern sogar über zwei 13 MP Kameras, eine an der Vorderseite, die andere an der Rückseite. Als ob das nicht genug wäre, so hat jede der beiden auch einen eigenen leistungsstarken Sensor. Die rückwärtige Kamera hat eine f2.0 BSI-Blende und die Frontkamera einen f2.2 BSI-Sensor. Beide Kameras verfügen über Weitwinkel-Linsen, eine 28 mm in der rückseitigen Kamera und eine 2 mm vorne. Beide können HDR-Bilder aufnehmen und in HD aufzeichnen. Das Phone verfügt auch über Dual-LED oder Dual-Tone-Blitz und Autofokus mit Zoom-Fähigkeiten. Das HTC Desire EYE bringt verschiedene Software und Apps, die bestimmt jeden leidenschaftlichen Selfie-Fan zufriedenstellen werden. An oberste Stelle ist Auto Selfie, womit die Frontkamera Bilder ohne Drücken eines Auslöser aufnimmt, sobald die Kamera fokusiert hat und sie für 2 Sekunden ruhig gehalten wird. Das Gerät misst 151,7 x 73,8 x 8,5 mm. Laut IPX7 rating kann es Wassertiefen bis zu einem Meter für 30 Minuten standhalten. Das HTC Desire Eye rühmt sich außerdem eines 5,2-Zoll großen FHD-LCD-Bildschirms, eines Qualcomm Snapdragon 801 Prozessors, 2 GB RAM und 16 GB internem Speicher. Die Speicherkapazität kann mit einer microSD-Karte um bis zu 128 GB erweitert werden. Ein 2400 mAh Lithium-Polymer-Akku versorgt das Gerät mit Strom. Wie bei allen aktuellen HTC-Phones üblich, verfügt das Desire EYE über nach vorne gerichtete Stereo-Lautsprecher mit HTC BoomSound Technologie.